I have literally been itching to try this beauty since it arrived a couple of weeks ago. Quite simply, it’s the sexiest purple I have ever seen, a lovebomb of sparkle and glimmer held together in a shimmery suspension. 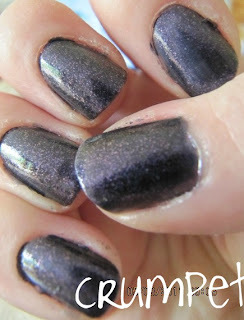 At heart, Julieanne is a purple glitter that’s not a glitter. Bless her, she so wants to be Little Miss Sparkle, and she IS, but without the scratchy nastiness that sometimes comes with a glitter, so you get all the spectral beauty of a glitter without the disasvantages. And bless her again, she has a bit of an identity crisis, does Julieanne. When I wore her to work this morning, she was a cold, dark midnight purple, despite the starburst. Now that I’m home and sat in a brighter room, she’s a dark, royal Cadbury purple, almost electric in intensity, and no matter how hard I try, I just can’t capture her at her electric best. 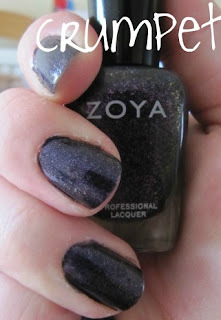 So, if you’re looking for a purple glitter without the crunch, look no further. If you’re looking for dark, starry glamour, look no further. If you want the most gorgeous purple ever created ?